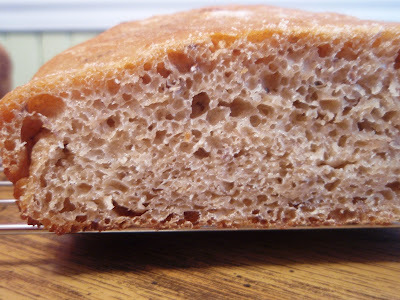 A Southern Grace: bean bread? Yes, bean bread. Just in time for Cinco de Mayo. There's no question that I love my beans, but to add them to bread? It seems weird and inappropriate. But add them I did, and the result? Although the original recipe called for black beans (arguably my favorite bean) and barbecue sauce, I had some pork and beans burning a hole in my cabinet, so I opted for those. The recipe also included chopped chipotle peppers, which I should always have on hand but didn't. Instead, I used some chipotle chile powder. Folks, this stuff is potent. How potent, you ask? After adding a measly half-teaspoon to my batter and stirring a bit, I suddenly found myself sneezing. And sneezing some more. I counted nine sneezes, but it's hard to focus on counting when you're thrashing around your kitchen like a fish out of water. And don't worry, I didn't sneeze into the bowl and I washed my hands after my fit. I know you were concerned. I'm pleased with both changes I made, even though they were out of necessity rather than personal preference. The pork and beans pretty much disintegrated into the batter. They made the bread moist (although it looks deceivingly dry) and a little bit sweet, while the chile powder definitely delivered some punch. Here's how it goes: Take bite, taste sweetness, swallow, feel burn. Take another bite to stop burn, taste sweetness, feel relief, swallow, feel burn. And on and on it goes. Yeah, I ate a huge hunk of it without really meaning to. It's a vicious (but oh-so-tasty) cycle. It's Cinco de Mayo, possibly my favorite holiday as it gives me an excuse to eat all the Mexican food I want (as if I needed a reason). 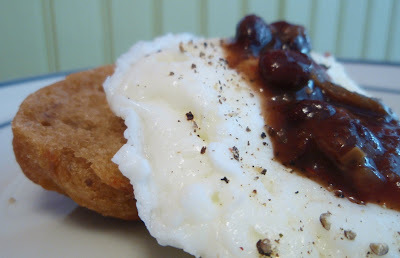 I'm loving my black bean pomegranate salsa, so for breakfast this morning, I had some toasted bean bread, leftover egg whites, and some of that amazing salsa (with fresh-cracked pepper, of course). 1. Do whatever you need to do to prepare two cups of active sourdough starter. 2. Drain the beans, reserving 1 cup of the starchy juice per batch of bread. If there isn't a full cup of juice, add water to make 1 cup of liquid per batch. 4. Pour the bean juice into a large mixing bowl. Add the bean mash and sourdough starter. 5. Add and (carefully) stir in the whole wheat flour, chile powder, cumin, oregano, and salt. 6. 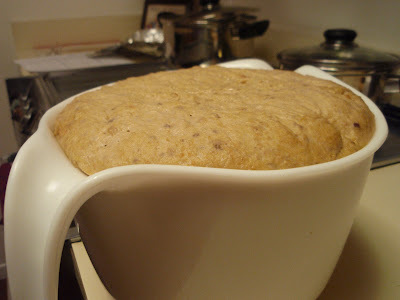 Add the bread flour a cup at a time, until the dough becomes too stiff to stir. Pour out the dough into a well-floured surface. 7. Knead the dough, adding flour as needed, until the dough is fairly smooth and springy. You may need to add more flour than is called for above, depending on how liquid the beans are. Knead 6 to 10 minutes. The dough should be soft and lively (lively?). 8. Transfer the dough to a lightly oiled bowl, turn, and cover with foil. 9. Let rise in a warm place until approximately doubled in volume (Eb took all night). 10. Punch the dough down, transfer to a well-floured surface, and cut into 2 or 3 (or 4, if your starter is as spectacular as mine) equal pieces. 11. Grease some baking sheets and/or loaf pans. 12. Shape the dough into loaves. Circle, oval, massive blob--it doesn't matter. 13. Place the loaves on the baking sheet or in the pans, cover with foil, and let rise again in a warm place for 1 hour. 14. Preheat the oven to 425 degrees F.
15. Make 2 or 3 diagonal slashes in the tops of the loaves with a knife to allow the dough to expand in the hot oven. 16. Put the bread in the oven, and put a cup of water into a tray on the bottom of your oven. Yes, my pan warped in the super-hot oven. Oops. 17. Bake for 35 to 40 minutes, or until the crust is caramel brown, and the loaf is done. Cool on a rack. 18. Take some Bean-o and enjoy. Bread is simply not photogenic. That looks great, and sounds like the trinity of happiness - bacon, beans and bread all in one. I never would have thought to add beans to bread, but as soon as I read the post title, I thought this was a great idea. This sounds like it would be a hit and most definitely appropriate for today. I've never heard of such a thing, but I'm intrigued! I've been wanting to get some sourdough starter going. This might be the thing that motivates me to do so! Pork & beans in bread. I'm just....wow. First baby food now beans. When will the insanity stop? hehehehe just kidding sounds awesome (of course pork and beans how could it not be?). I love bread, and I love beans...seems to me that this combo would be great. Sound really flavourful and most, definitely gonna give this one a try! I felt like I was reading a foreign novel but in a good way. I would never have thought beans in bread but hey, why not? 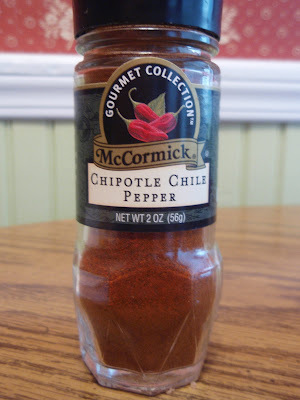 I love that chipotle pepper powder - never seen it in our part of the world. YES!! Carbohydrates = bueno! :-) Very yummy sounding! I personally like the breakfast that you put together. I'm really into egg whites for breakfast right now so it's sounding great. Wow! Now I am saying this in the nicest, most supportive, loving way possible but this is the strangest recipe I have ever heard of and I love it, especially the name. I mean I would have never thought to put these things together. I am going to make this puppy along with that salsa because I just have to try it. Thanks for this. Fire-breathing beany bread? My kind of food. The hotter the better. I made white bread over the weekend, we could make sandwiches with a slice of beany and a slice of white. I love pork and beans, it's the Yankee in me. I have never heard of bean bread before - it's genius! I really want to try this one! I love it-sounds quite mad but in a brilliant way! Whoa. Where has this recipe been all my life? I cannot have enough beans in my diet, and this might just be the perfect way to have more! And yes, I agree with you about black beans. They're just so wonderful. I'm pretty attached to white beans as well. Thanks for the post! That has to be the most creative bread recipe I've ever seen! Looks delicious. I have to disagree about bread not being photogenic though, those little bubbles look gorgeous! Who would have thought? Sounds fascinating and delicious! What a unique way to celebrate the holiday! Wow, that's weird and crazy. I would have never thought to put pork and beans in bread. My pans warp, also. It scares me. I would never have thought of this is a million years, pork and bean bread. and it works!! Great job. This is one of the most unique bread recipes I have ever seen. Very creative! Bean bread with chipotle chile powder is a great idea!